How do you spell stress relief? In our book, right now, it's spelled S T L U C I A. An amazing four-night package is available NOW through Lincoln's bday (Feb 12) at Discovery at Marigot Bay (which happens to be James Michener's favorite bay in the Caribbean). The "Economic Stress Relief" package includes four-nights in a Bayview room, a $100 food and beverage credit (for use at the hotel's 2 restaurants or its chic swim-up bar), two complimentary welcome cocktails, all taxes, round-trip transfers AND two ESPA stress-relieving massages at the spa in the hotel's Zen Gardens. Priced from just $1,977 for two (or upgradeable to a one-bedroom suite for $3,1117). For more info on this and other non-wallet-busting getaways, contact The EliteTravelGal by clicking HERE. 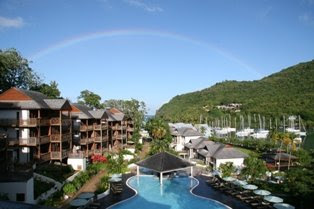 St. Lucia is a great getaway. Thank you for the information. I'll be sure to pass this on to my readers.